ARTICLES What Are Consumer Credit Counseling Services? You can find consumer credit counseling services from independent agencies certified by the National Foundation for Consumer Credit. Credit counselors can help you with budget planning or a debt management plan to help you pay off your debt. Initial consultations with counselors are often free and can be done by phone, online, or in person. Dealing with debt on your own can be very difficult, especially if you owe a large amount of money. Although there are many ways that you can get out of debt, seeking Consumer Credit Counseling Services (CCCS) from an accredited agency is one of your best solutions. CCCS can help you get your finances in order so that you can pay off your current debt and avoid going into more debt in the future. Here are a few things you should know about CCCS if you’re looking for a way to deal with your debt. While it may seem hard to believe, using credit cards wasn’t always a fact of life. When credit cards were first introduced, not many people understood what they were or that using a credit card incorrectly could result in a tremendous amount of debt. In response to this new invention, the National Foundation for Consumer Credit (NFCC) was formed in 1951. The NFCC was originally founded to promote financial and credit literacy among the population, but their services soon expanded. In particular, the NFCC started offering credit counseling services across the country. Consumer Credit Counseling Services agencies have been certified by the NFCC and operate similarly to an independent franchise of any other large business. Agencies that offer CCCS are independently operated but are members of the NFCC, which both certifies individual counselors and provides educational materials. Every CCCS that you visit is also a 501(c)(3) nonprofit organization. This is very beneficial to those dealing with credit card debt, as it means the counselor is motivated to help the client get out of debt instead of making a profit. When dealing with large amounts of debt, it’s common to worry that you’ll be judged if you seek assistance. One of the main purposes of a CCCS is to provide consumers with a judgment-free environment where they’ll be able to receive the support and advice they need to get out of credit card debt. Your credit counseling session is free of charge and is not binding in any way. The only goal is to give you a solid plan to help you get out of debt and stay debt-free. One of the biggest benefits of visiting a Consumer Credit Counseling Service office is the opportunity to arrange a debt management plan. The primary purpose of a debt management plan is to consolidate your debt payments and your unsecured debt into a single payment. Having only one monthly payment should be much easier to manage; you won’t have to keep track of multiple payments to multiple creditors. Debt management plans also have several other advantages over trying to handle your debt yourself. The monthly payment you make as part of your debt management plan may be reduced from what you would pay your creditors individually. You may also be able to lower your interest rates. In general, a debt management plan will take between three and five years to pay off, depending on the amount you owe and how many creditors you have. While this may sound like a lot of time, it could take decades to pay off your credit card debt if you continued to make only the minimum monthly payments on your cards. You also need to make sure that you set aside enough time for your counseling session. Trying to rush through a session or ending it early because you have other commitments is never a good idea. In general, you should set aside an hour to an hour and a half for your session. Virtually everyone can benefit from CCCS, even those who are not currently dealing with debt. CCCS agencies will usually offer financial planning services that can be useful for those who want to live their lives debt-free, and the agency may also be able to give advice for dealing with several different types of loans, including student loans. CCCS are particularly useful for those struggling with debt. With aid from your counselor, you should be able to get your finances in order, pay off your debt, and work towards a more stable financial future. 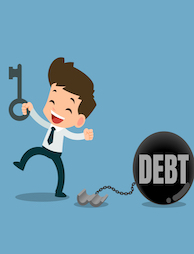 When you’re living with debt, you may need professional help, and Solvable is here to connect you with some of the best debt relief companies in the country. You can read our reviews to decide which debt relief company is right for you and review our articles to learn more about different solutions for clearing your debt. Previous PostPrevious How Can a Credit Counselor Help You Manage Debt?